Indoor Nest Cam IQ vs Arlo Q Comparison — Which Should You Buy? The Nest Cam IQ Indoor gives you the latest technology and smart integrations, but the Arlo Q is easier on your wallet. The Nest Cam IQ Indoor has the latest technology and smart integrations, but the Arlo Q is the more affordable option. So which one is best? Night vision range 20 ft. 25 ft. Both the Nest Cam IQ Indoor and the Arlo Q are excellent indoor cameras with top features. Quite frankly, it was hard for us to choose between them—they’re both good choices. But we have to give the edge to Nest because Nest’s products consistently offer the latest technology, and we’re suckers for innovation. That said, just like most things Nest, the Nest Cam IQ Indoor is pricey. Both the camera itself and Nest Aware, the monthly service plan, will hit your wallet hard. If you want similar features at a lower price, the Arlo Q will serve you well. Smart features: The Nest Cam IQ Indoor gives you more smart features, like built-in Google Assistant, while you still need a separate smart speaker for the Arlo Q. Price: The Arlo Q costs less than the Nest Cam IQ Indoor—but its features are less innovative. 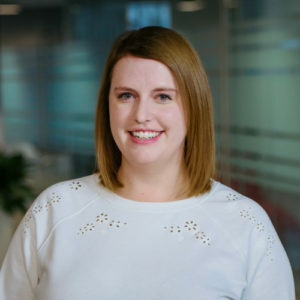 Subscription services: The Nest IQ needs Nest Aware for access to the IQ’s best features, like familiar face detection, which can tell people apart. Integrations: The Arlo Q integrates with other Arlo cameras, but there are no other Arlo devices, like a security system or a smart thermostat, which Nest does have. Cloud storage: Nest gives you a small amount of free cloud storage, while Arlo Q is more generous. Wall mounts: The Arlo Q gives you more mount options, like wall mounting and a magnetic base, but the Nest has a more solid design. The Nest Cam IQ Indoor and the Arlo Q are both great choices for indoor cameras—it just comes down to which features you want and how much you want to pay for them. The Arlo Q gives you better value for your money, but fewer smart features. As we’ve already mentioned, the Nest Cam IQ Indoor is expensive. The camera itself retails for $299.99, which is a solid $140 more than the Arlo Q. And while the Arlo Q gives you a week’s worth of free cloud storage (so you don’t have to subscribe to its monthly service plan), Nest is stingy. Nest offers only three hours of free cloud storage before its paywall kicks in. That’s nothing. Nest also restricts access to its most impressive features, including familiar face detection and motion zones. To be fair, Nest recently introduced its $5-per-month Nest Aware plan, which gives you five days of cloud storage and full feature access for a low monthly price. But still, Arlo gives you seven days for free. And even Arlo’s service plan gives you more storage for less money per month. Both the Nest Cam IQ Indoor the Arlo Q have 1080p resolution—but the Nest Cam adds a 4K sensor and HDR. Both the Nest Cam IQ Indoor and the Arlo Q are HD cameras—and they both record in 1080p. But Nest sweetens the deal by giving its IQ Indoor camera both a 4K sensor and HDR. Now, the 4K sensor does not mean the Nest is a 4K camera—it does not record in 4K resolution. (Your internet bandwidth is grateful it doesn’t.) But the 4K sensor does make it so you can more easily zoom in on images and still see every little detail clearly. HDR is another nice little perk of the Nest Cam IQ Indoor. HDR is commonly used in non-security cameras and high-quality TVs. Basically, it helps improve the contrast so pictures look prettier and something like bright light coming in from a window doesn’t throw off the image quality for an entire room. In our tests, both the Nest Cam IQ Indoor and the Arlo Q delivered clear images that still looked good when we zoomed in. But the Nest’s HDR does help images look consistently good, even under difficult lighting conditions. Keep mind, all those extra image features in the Nest Cam also take up more of your internet bandwidth. Nest recommends you have an internet speed of at least 2 Mbps, but we’d say you need something faster than that. We recommend you have an internet speed of at least 2.5 Mbps per camera before you even think about installing an indoor or outdoor camera. Find out more about what Mbps means and how much internet speed you really need here. Remember, the Nest Cam isn’t the only device you’ll be running on your Wi-Fi, and the faster your internet the better. You don’t want your Netflix stream to stop to load every ten seconds. You can set your Nest Cam to use less bandwidth by lowering its recording quality. But in that case, why bother paying so much for such a high-end camera? Both cameras can work with smart hubs and IFTTT, but only the Nest Cam IQ Indoor has Google Assistant built in. If you have a Samsung SmartThings or Wink smart hub, then both the Arlo Q and the Nest Cam IQ Indoor will communicate just fine with it and with your other smart home devices. But as usual, Nest didn’t stop there. Nest has a long list of manufacturers with products that can integrate with Nest components. In addition, the Nest Cam IQ Indoor comes with Google Assistant built in. You read that right: the camera literally comes with Google Assistant already in it. If you want a local storage option, Nest Cam does not have one. But the Arlo Q Plus gives you a local storage option in a camera that costs only $50 more than the regular Arlo Q. If you’ve always wanted a Google Home but don’t care about the music speaker part, then the Nest Cam IQ Indoor will be both camera and smart assistant for you. And if you were going to buy a Google Home anyway, then having one built into the Nest saves you $129 (which makes the camera’s price almost on par with the Arlo Q). The only downside is the Nest Cam’s Google Assistant can’t control . . . the Nest Cam itself. You can ask Google to play the camera’s live feed on your TV, but you can’t have Google turn your Nest Cam on or off. We think that’s pretty weird, but hopefully it’ll upgrade the system soon so the Google Assistant in the cam can tell the cam what to do. Does the Arlo Q have Google Assistant? The Arlo Q also integrates with Google Assistant, but it doesn’t come with the system built in. You’ll still need a separate Google Home to use with the camera. Both Nest and Arlo cameras do work with IFTTT, which lets you connect a whole host of smart devices to each other and create “recipes” to make them work together. If you want your Philips Hue lights to turn on in your living room every time your Arlo Q detects motion near the front door, you can make that happen with the IFTTT app. Both Nest and Arlo have smooth, easy-to-use mobile apps—but the Arlo app showed a five-second lag time in the live feed. We had no (or rather, few) issues using either the Nest or the Arlo mobile app. Both of them make it extremely easy to set up the camera and control its functions. While both Arlo and Nest have desktop applications, you need the mobile app to set up the cameras. For both cameras, you just download the application, input your Wi-Fi password, scan a QR code, and you’re good to go. Both apps have the same basic layout and the same basic features. You can view a live feed on the home screen and turn the camera on and off. Both apps also let you use geofencing to arm or disarm your camera depending on the location of your smartphone. 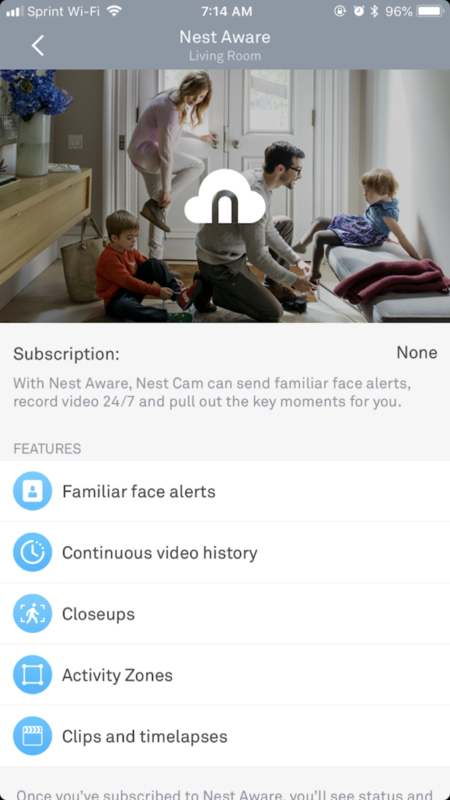 You can set custom schedules for both Nest and Arlo cameras. If you want to get super specific, you can create custom rules for your camera, like having the camera turn on at 7 a.m. when you leave the house, turn off at 12 p.m. when you stop by for lunch, and turn on again at 1 p.m. when you leave. Whatever fits your life. Both apps also let you draw activity zones, which keeps you from getting a notification every time your beagle walks into the kitchen (unless you want to know that kind of thing). Nest calls activity zones “motion zones,” and you have to subscribe to a Nest Aware plan before you can use them. Arlo gives you that feature for free with the camera, and you can set activity zones around things like the front door and the windows rather than get notifications for the entire room. Nest motion zones, a.k.a. activity zones, let you set multiple specific areas in a room for the camera to watch and alert you about, so you know if someone walks through a door or opens a window. Arlo has the same thing, but you don’t have to pay a monthly plan price to access it. The Nest Cam IQ Indoor and the Arlo Q have very similar features as far as indoor cameras go, although the Arlo Q’s are a bit less cutting edge. The Nest Cam IQ Indoor will inevitably cost you more money, but it does integrate with your entire Nest system if you already use Nest devices. The Arlo Q is more affordable, but its mobile app really only integrates with other Arlo cameras, not things like a whole security system or a smart thermostat. You should get the Nest Cam IQ Indoor if . 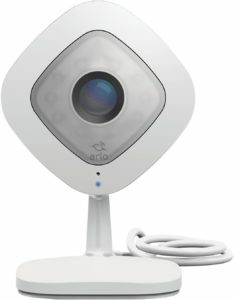 . .
You should get the Arlo Q if . 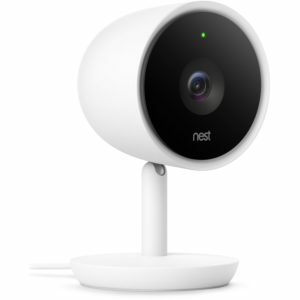 . .
Do you have the Nest Cam IQ Indoor or the Arlo Q? Which do you think is a better choice? Let us know in the comments!